Tips for minimizing corn and soybean field losses and putting the most of these high-value crops in the bin. Farmers across much of the Northeast are having a slowed-down fall harvest due largely due to muddy fields and downed corn. Crop field losses are poised to climb quite quickly, asserts Penn State Extension Agronomist Del Voight. "I recently spent a day off riding in combines, noting what's going on in the fields. In one of those combines, I got to witness a grower attempting to harvest downed corn. It wasn't just time consuming. It was really depressing – especially for him! BIG MONEY RIDING ON SPEEDY HARVEST: Weather conditions will likely dictate how fast and long you want to work to get in this year's high-priced crops. reversed direction, it was even more dramatic. The best method was to push into the corn from the opposite direction that corn was down." Stay in corn or switch to beans? 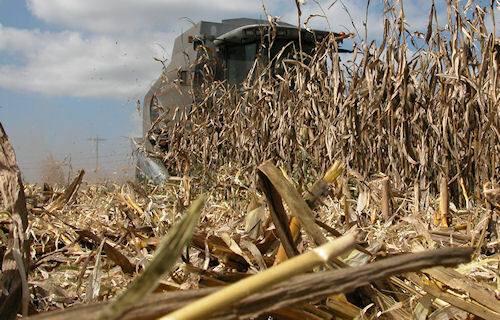 It only takes two kernels of corn per square foot to equal a one-bushel loss per acre. It takes four beans per square foot to do that, and 14 kernels of barley. Three Midwest universities found that once soybeans reached 13% moisture in late September, field losses shot as high as 20% within 10 days of wet early October weather. And 85% of those losses occurred before the beans entered the combine! Iowa State researchers found that cutting height impacts soybean field losses. Cutting down to 3.5 inches instead of 6 inches puts an extra three bushels of beans in the bin. corn tripled from 5% to 18% from October to December. to escape the combine due to shatter loss. If you're one that waits until after high-moisture corn harvest to start soybean harvest, you might well be sacrificing a significant portion of your bean yields. "Last year, I supervised a soybean contest harvest that was 75 bushels per acre in late September," notes Voight. "My variety test plots were across from the contest harvest. We cut those beans in late October and got 51 bushels per acre as an average for all entries. "One of those entries was the same variety as the contest yield. Lodging and shatter losses accounted for nearly a 25 bushels in field losses due to delayed harvest."